OK, so that might not exactly be how the phrase goes! But I firmly believe that everything about business is personal; and it’s this personal relationship that’s crucial to becoming a trusted advisor to your customers, and also one of the reasons I love working at Waterstons. You might be sitting reading this, thinking “I do trust my supplier(s), they deliver what I want, when I want, at a cost I’m happy with”. Well that’s all good, and sure, those things are clearly important, but a trusted partner can deliver so much more. So why would you settle for less? It’s not unusual for me to arrive on-site with a company who I’ve not worked with before, to be faced straight off with a request for a price to deliver a particular solution. A trusted advisor should have the back bone to challenge the status quo. It’s important to understand what problem, challenge or need the company has. There’s always value in looking at other options, but you can’t do that until you really understand what lies beneath. By bringing to bear a wealth of knowledge from across your industry sector, we ensure technology works for you, not the other way around. Ultimately we may come back to the initial idea, but by really understanding the problem, all the possible solutions, prospective pitfalls, and by challenging what is needed, we may be able to suggest a better and even more cost effective solution. It is this culture of honesty and openness, that our customers respect most. A trusted advisor or partner should always put the customer’s interests first. Whilst this sounds obvious on the surface, it may be a bitter pill to swallow for many a supplier. Sadly, the IT industry is full of hidden costs, inflated margins, vendor targets and poor understanding of requirements, but a trusted technology advisor should help guide you through the maze; make you aware of the pitfalls, and advising you what will be the most effective solution, is truly best even when it doesn’t benefit them. What about your own customers or service users? This is a critical part of the equation and often overlooked.The trusted advisor should take time to understand your customers and their pressures and pain points. This way they can help you to provide a better customer journey – whether it’s improving customer service, reducing costs, improving quality; or indeed all of these. Improving your customer’s experience leads to happy customers and happy customers keep businesses afloat. Businesses are amazing. Different industries operate in many different ways, and it’s getting to know your business, and your sector, that really makes a trusted advisor tick. Getting to know your world, isn’t just a business opportunity, it’s an incredible learning opportunity. It allows the trusted advisor to see first-hand the impact that they can have, but also to see how different organisations do things and the effect this can have. They must be happy to openly share their knowledge, experience, and crucially even the risks with you. It’s important for a partner to integrate seamlessly into your team. This way they get to see what really goes on in your organisation and can provide insight to add even greater benefit. A long term relationship is inherent in any true partnership with a trusted advisor. Trust is earned and built over time. It doesn’t come overnight. We’ve found that investing our time to get to know all areas of your business, even if there isn’t an immediate way we can help, puts us in a unique position to provide an external, independent viewpoint. Like any long term relationship there will be good times, and sometimes, hard times. A good trusted advisor will stick with you through thick and thin, because it is ultimately through your success that they will achieve success. It goes without saying that any trusted technology advisor wouldn’t get very far without the necessary technical and commercial credibility. Whilst being able to understand and communicate at a business level using jargon-free language is key, a trusted technology partner absolutely must have technical know-how, relevant accreditations, and a solid track record in delivery. However, unless this is also underpinned with knowledge of you (the customer), and your customer, it’s less likely to succeed. Working with an organisation which gets to know you and your customers can be a real game changer. How many of your suppliers do you really trust? How many have taken the time to really get to know you (personally) and your business? Think about how a trusted advisor could use their knowledge and understanding to ensure any investment you make in technology delivers real business value, helping you to retain existing customers and drive new business? Why should you settle for less? 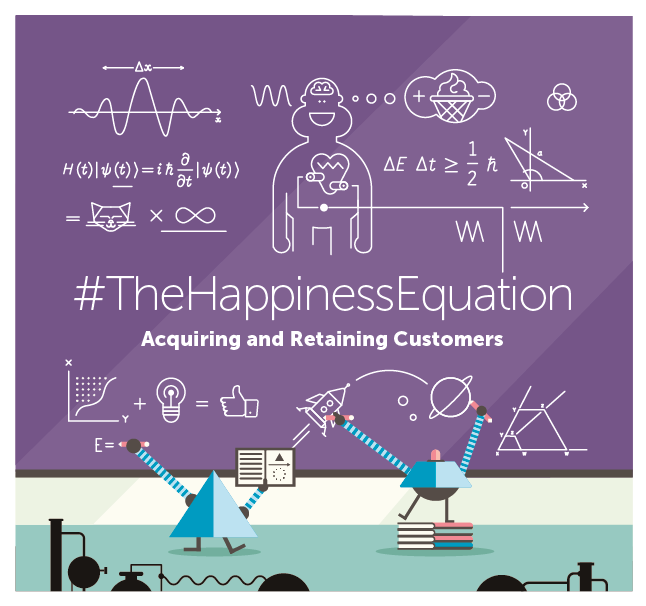 It's another part of the Happiness Equation.